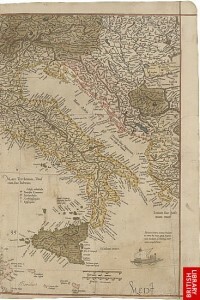 Now available on the British Library’s Online Gallery of Virtual Books is the Mercator Map of Europe. You might assume from the name that it’s an early printed atlas, but this book is far more interesting than that. 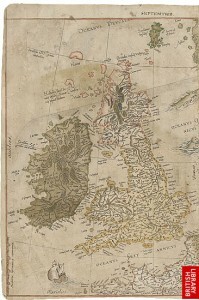 Mercator compiled several maps from copies of wall maps of the British Isles, Europe, and the world that he had available in his workshop. He carefully cut up and pasted parts together to fit the atlas format. He created aesthetically balanced regional maps, removing tables and illustrations that did not wholly fit on the page and making space for customised scale-bars for each of the “new” maps. The process gave him a chance to experiment with the creation of regional maps as a step towards his long-term ambition of producing an atlas. For the rest of the atlas he used hand-drawn maps by himself, an urban map of Ancona in Italy, and numerous maps from an atlas published in 1570 by his friend and rival Abraham Ortelius. Some of those which he raided for the compilation included his 1569 world map, 1554 map of Europe, and Ortelius’s great Theatrum Orbis Terrarium, 1570. Every page of the book is now available, and online can be enlarged so the astonishing detail can be seen. Maps feature quite often in Shakespeare’s plays, most crucially for the plot in King Lear where the dividing of the map also symbolises the disintegration of order. Maps are usually reassuringly factual, helping us to make sense of the world, so it’s particularly interesting to see this atlas in which maps are cut to pieces and stuck together. The maps of England are based on two copies of Mercator’s 1554 Europe map, fitted together. 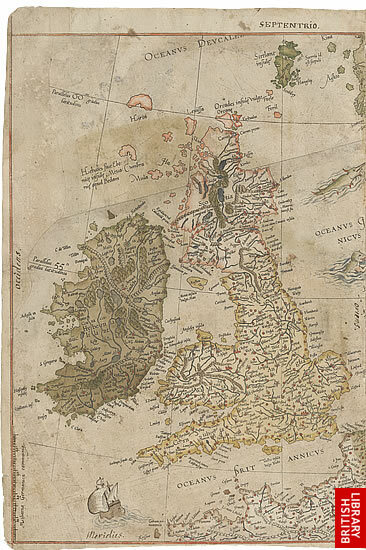 The commentary accompanying the English map suggests that although English and Scottish mapmakers were advanced in the sixteenth century, there were no printers to make their maps widely available, so manuscript maps were all that would have been available. In fact maps were guarded by the government, who recognised the dangerous potential of accurate maps to assist invaders. It is suggested indeed that one of the original maps from 1564 may have been created by the Scottish Catholic Priest and map-maker John Elder, who had a subversive aim, hoping that his accurate maps might help France or Spain to invade England and overthrow the Protestant government. It’s rather reminiscent of the scene in Henry IV Part One where the conspirators, who plan to be joined by Scottish powers, consult a map to see how they might divide England once they have removed the King from the throne. 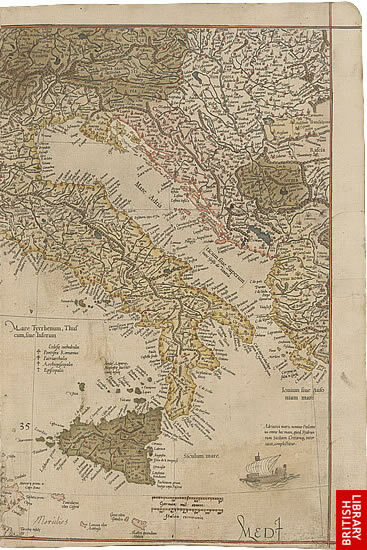 Elsewhere in the Atlas are a number of maps of Italy, a reminder of its importance to Europe even though it was at the time made up of a number of individual states over which other European powers fought long-term wars. Shakespeare locates many of his stories of passionate love, hate, deception and violence in the Italian cities of Verona, Venice, Rome and Mantua among others. Mercator’s great atlas is a fascinating object that repays close examination, and is accompanied by both written and audio commentary for each page of maps. This entry was posted in Shakespeare's World and tagged British Library, cartography, Italy, map, Map of Europe, Mercator, Ortelius. Bookmark the permalink.